Named after its shape of a larger drumhead and a relatively smaller base that resembles a Flowerpot. The Flowerpot Drum is a type of Tanggu (堂鼓: Hall Drum), often played in traditional Chinese theater and during Opera fight scenes. 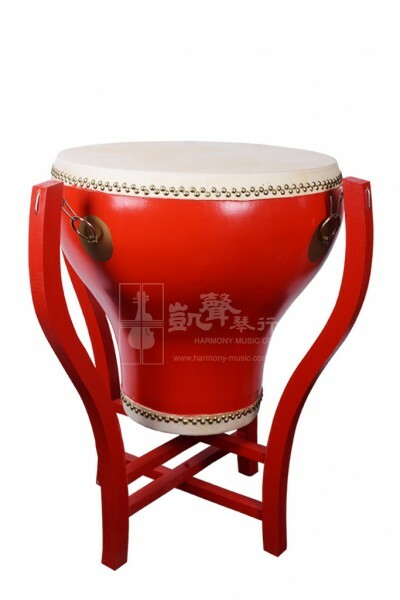 With its classic strong tone and a pitch lower than the standard Tanggu, the Flowerpot Drum can be played to perform various sounds. While this drum is often struck during war scenes to increase theatrical tension, lighter strikes of this Drum can be used in Peking Opera (京劇) to accompany the entrance of female characters and other melodies. Comes with a pair of drumsticks, the Flowerpot Drum is made in Suzhou and measures in approximately 60 cm in diameter. This Suzhou 18 Chinese Inch "Flowerpot" Drum set also comes with a Drum stand, to ensure accurate shipping charges, please add the following Drum stand (link) to your shopping cart when check out! If you do not require the Drum stand, you can check out with this Drum right away.